Our work begins with community. Farmers’ groups throughout northeastern Thailand (the Esan region) develop sustainable agriculture techniques based on the local ecology and expand their positive impacts by training and educating other members of their communities. By producing high quality, organic rice and a diversity of fruits and vegetables, AAN members create sustainable livelihoods for their families and build concrete bases for alternative, local economies. As farmers throughout Thailand are heavily impacted by debt, environmental degradation and health problems, AAN members have moved beyond these problems and work to support others in transitioning away from chemical-intesive moncropping. Click here for more information from Supa Yaimuang, coordinator the Sustainable Agriculture Foundation, which provides essential support for our network. Our members live in eight northeastern provinces – Roi Et, Ubon Rachatani, Yasothon, Mahasarakam, Khon Kaen, Kalasin, Petchabun and Surin – and we often work with farmers groups in Sisaket and Udon Thani. 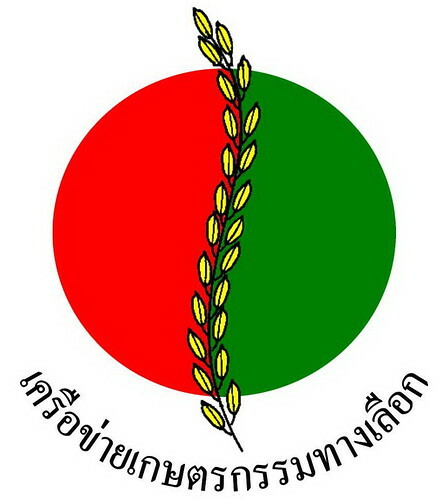 We also work together with the Thai government through the Community Organizations Development Institute (CODI), Agricultural Land Reform Office, and a number of other bureaucratic organizations. Consumers are an essential part of building a sustainable food system. In Surin, Mahasarakam and Ubon Ratchatani provinces, green consumer groups have sprouted up to support Green Markets and be advocates for local producers. Informed consumers have the power to make alternative choices and build direct relationships with producers themselves. In the coming year, with the support of the Thai Health Promotion Foundation, continuing green consumer efforts will be a priority for our network. By forming relationships with farmers groups in other districts and provinces, our network is able to connect farmers to information about current ag-related issues and policies. This knowledge empowers farmers to mobilize and work for change, both locally and nationally. The AAN represents the voices of tens of thousands of farmers and their struggle for a sustainable and fair food system in Thailand. We also connect issues in Thailand globally, by working with La Via Campesina, Grain, ENGAGE, and a number of other organizations with whom we have developed relationships in solidarity. The AAN empowers communities to develop sustainable alternatives and work for change in society. My name is Rithy, Cambodian. I am doing research about agriculture work as one time called COOP. This project seem very good to learn. Would you mind if I want to visit. You can contact me back with skype as well: skype: thulrithy. Look forward to hear back from you. Please note our posting of the Furadan Yasothon story on our website. Also feel free to send us any NE Thailand-related news so we can publish it in Thai and English. No charge! I just moved to Amphur Kuchinarai, Kalasin. In the 80’s I ran 40 acres of organic produce in N.W. USA. Miss farming and am getting a market garden going on rental land before moving to small farm and getting serious. Happy to network with anyone about almost anything. My issues are mainly around finding materials and resources. Just getting some drip irrigated melons going.